The purpose of handicaping is to level the playing field so contestants of all levels can compete. If the #14 Ranch Hand is not offered and the #11 Ranch Hand is, there is no cap on the Sorter in the #11 Ranch Hand. Any numbered division can be sanctioned through special sanctioning. All Levels, a Beginner or Rookie, and three other classes must be offered to qualify as a sanctioned event. Auto-Draw is designed to allow new contestants to the sport an opportunity to find rides and meet other contestants. All RSNC divisions have a 5 ride limit. Contestants can Pick up to 4 and Draw 1 or they can Pick less and Draw up to all 5. 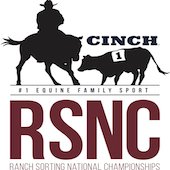 The handicap system for all Sanctioned RSNC events in ranch sorting will be as follows. Each total team rating number below the highest possible team number in a division will receive one additional second beyond 60 seconds to sort their cattle. Then those additional seconds will be subtracted from the team’s final time on the cattle sorted. This system levels the playing field for all sorting contestants with a handicap based on their rating. All Contestants in the Masters Division must be 50 years of age or older at the end of the calendar year. This event is run as a #10 Handicap Division.